Over time, we will be building up a list of music resources on this page and categorizing them for ease of reference. Used Music Instruments Classifieds - Instrument Wire is an online classified site featuring new and used guitars and other musical instruments for sale. Learn Guitar with Online Lessons - Center Stage Guitar Academy offers a comprehensive approach to learning guitar through a series of online guitar lessons that gradually builds from the very basics to more advanced techniques. Beyond Guitar - Learn guitar online with no subscription. Learn using the free BeyondGuitar LITE video app available on iPhone, iPad, or Android. Find Piano Teachers - Want to Learn Piano? Our Music Teachers Rate the Top Online Piano Courses. 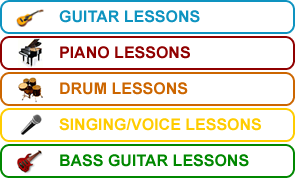 We also provide free online lesson videos to get you started. Guitar Lessons for Beginners - Free guitar lessons from GuitarMadeEz.com - "Your Free Online Guitar Teacher". NL-Guitar - A website that showcases Naftali Lahav's guitar articles, original compositions, and music courses that she's developed.